GET BEHIND THE WHEEL OF THE WORLD ’S #1 RACING FRANCHISE! Explode onto the circuit in the fastest, hottest cars. Tear through the streets of Chicago, Dubai, Italy & London in 24 Street and Pro-Racing events. Race to defeat the world ’s top 3 drivers! * True Driver’s Experience – A variety of visual cues delivers the true driver’s experience including a three-dimensional HUD that mimics driver head movement, inertia and G-forces. The depth of field also adjusts based on the speed of the car; so when the car is traveling at high speeds the perspective will shift to the distance putting the car/cockpit out of focus. * Driver Profile – What kind of driver are you? Driver profile tracks the player’s evolution as a race driver from event to event. This system is made up of a driver’s personality on the track, their success rate and any profile points and badges accrued all of which work together to create a tailor-made career and game play experience. Driver profile is pervasive throughout all modes: career and online. * Dynamic Crash Effect – When the player hits a static object or opponent car, the player will feel like they are ‘taking damage’. 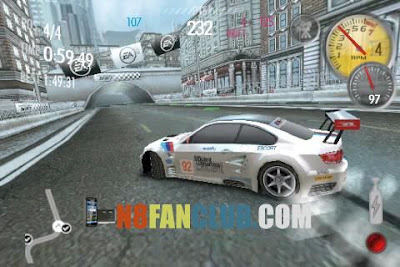 A combination of visual and audio effects will leave the player disorientated and briefly disrupt the race. 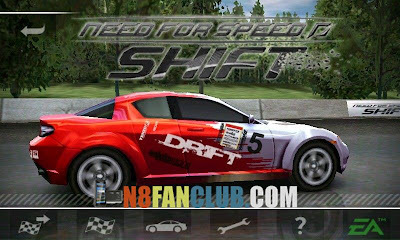 * Total Customization – Need for speed SHIFT features a comprehensive customization option that lets the player tailor every aspect of the cars performance and styling. Go under the hood to upgrade and tune your vehicle to increase its performance. The visual customization system allows players to personalize both the exterior and trick out the interior to reflect their individual style and preferences. 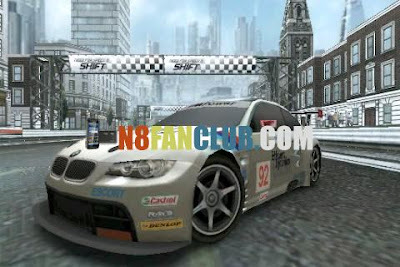 * Photo Real Cars and Tracks – Nearly 70 licensed cars are available including the Pagani Zonda F, Audi RS4, and Porsche 911 GT3 RSR. There is also over 15 real-world locations like Willow Springs and Laguna Seca as well as fictional circuits like downtown London. – Also reported working on Samsung I8910, Vivaz. Save Game Files for v1.0.9 – Extract the private folder in E or F and replace the files if prompted.